The Hickory Offset Umbrella Cover from Classic Accessories is made from durable Weather10 material that features a rugged fabric outer layer with a laminated waterproof and wipe-clean inside coating. Weather Leather trim looks authentic but wont rot. Fits offset umbrellas up to 13 ft. in diameter. Veranda patio furniture covers from Classic Accessories keep your furniture clean, dry and ready to use. They are made of heavyweight woven polyester fabric and have a special water-repellent and resistant undercoating. Air vents reduce inside condensation and wind lofting, while padded handles make for easy fitting and removal. When you buy a Classic Accessories cover you're also purchasing peace of mind. Not only will your furniture be protected from the elements, but you'll be protected with the easiest warranty in the industry. Use in any spaace on your patio. This 3 piece conversation set has an aluminum frame with PVC Wicker. Table size is 26 x 12 x 23.5 inch. Table has umbrella hole, with plastic cover. With 8mm clear glass op. 2 loungers with reclinder back function. Size is 65 x 66 x 23.5 inch. Wicker color is dark brown. Cushion color is very light blue. Hickory Patio Offset Umbrella Cover The Hickory Offset Umbrella Cover from Classic Accessories is made from durable Weather10 material that features a rugged fabric outer layer with a laminated waterproof and wipe-clean inside coating. Weather Leather trim looks authentic but wont rot. Fits offset umbrellas up to 13 ft. in diameter. 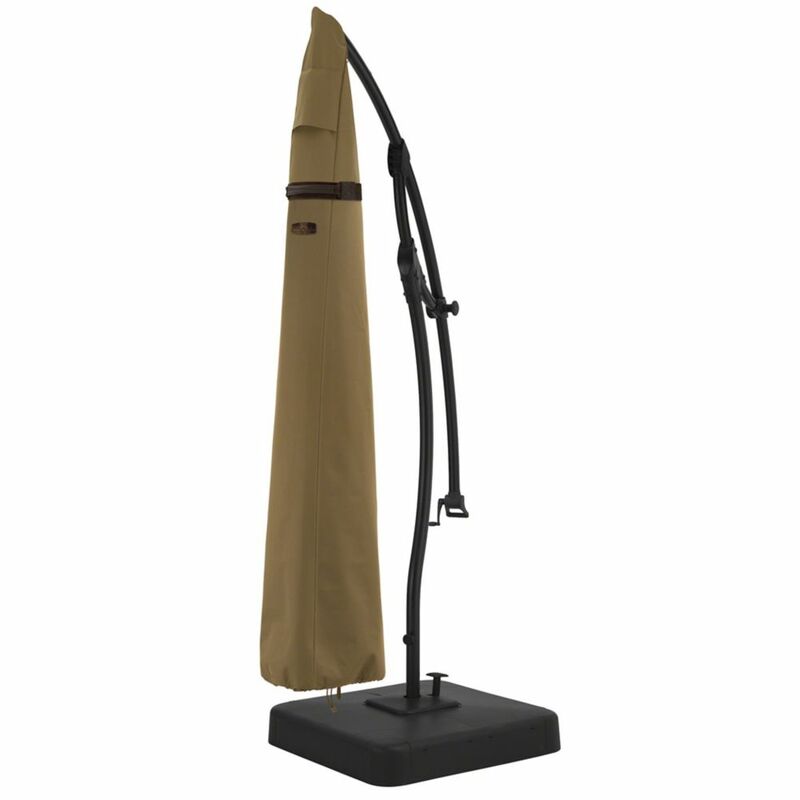 Hickory Patio Offset Umbrella Cover is rated 4.9 out of 5 by 21. Rated 5 out of 5 by elsbeth from Just what I wanted! Easy to cover umbrella, quality of material and workmanship is excellent. Rated 5 out of 5 by Josephine from Very good quality for the money.... Very good quality for the money. Rated 5 out of 5 by Tazchaz from I haven't used these yet but they appear to be... I haven't used these yet but they appear to be well made and should add years of use to our patio umbrellas. Rated 5 out of 5 by Bonnie60 from Works well. This cover is well designed...easy to get on and off and perfect for storing our umbrella when not in use and protecting it from the elements. Rated 5 out of 5 by wineguy66 from Very good cover, high quality, highly recommend. Very good cover, high quality, highly recommend.